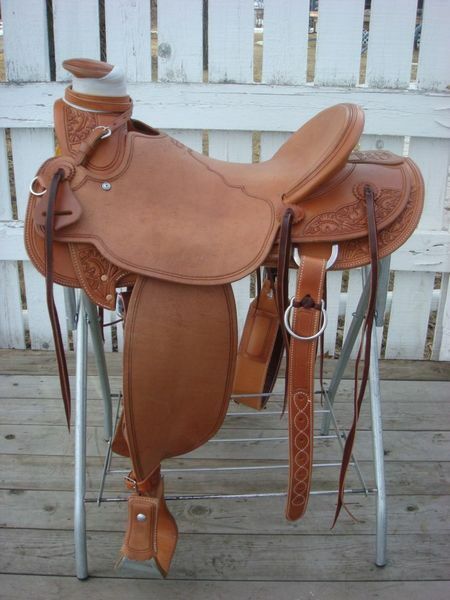 "Click Here to View Lady Ranch Saddles"
Right here is where you'll find our working rigs, Wades, Wood Post Associations, and All Around ranch saddles. 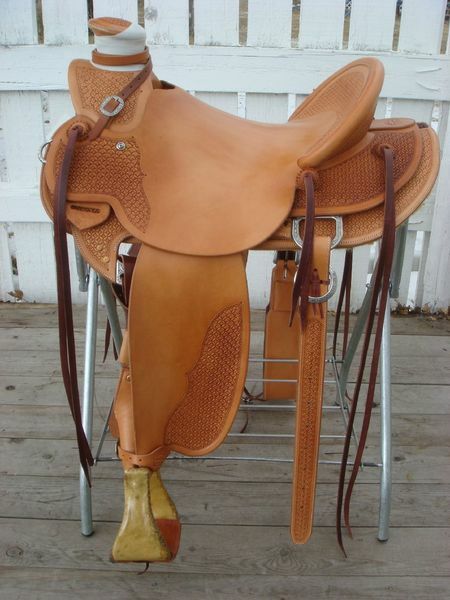 Each of the saddles shown below can be ordered with many different options. Call us to discuss how we can design one to your specifications, or ask us about one that's currently in stock. A sturdy, comfortable Wood Post Association saddle, this McCall Great Basin features a deep comfortable seat, smoothout leather seat with a single Rope Border with 3/4 Basket tooling, Stainless Steel hardware, 1" Cheyenne Roll, full leather bell stirrups, and hobble ring. This Northwest Wade #177 is smooth out, 1/2 King Basket and 1/2 2 Line border, 7/8 plate rigging, Stainless Steel Hardware, straight up 4" cantle, 4" Bells, Mule hide horn wrap, Hobble Ring, Crossover Lariat Strap. The smooth out NW Wade #124 has full Deluxe Roper Border, 7/8 plate rigging, Brass Hardware, Brass Conchos, 1 1/4" Cheyenne Roll, 4" Rawhide Bells, Mulehide Horn Wrap, Hobble Ring, Crossover Lariat Strap. This Custom 98 Wade with Mule bars is smooth out, 1/2 Oak tooling and full 2 Line border, 7/8 plate rigging, Brass hardware and conchos, 1 1/4" cheyenne roll, small inlaid seat, 4" rawhide bells, mule hide horn wrap, hobble ring, crupper ring, crossover lariat strap. Cowboss Custom Wade #1722 QH bars built on a Timberline tree, half rough out Hermann Oak top grade leather with inlaid seat. Geometric tooling, Jeremiah Watt Rigging Hardware, Buckles, Dees, Conchos and Hobble Ring, 4" Monel Stirrups with heel blocks. 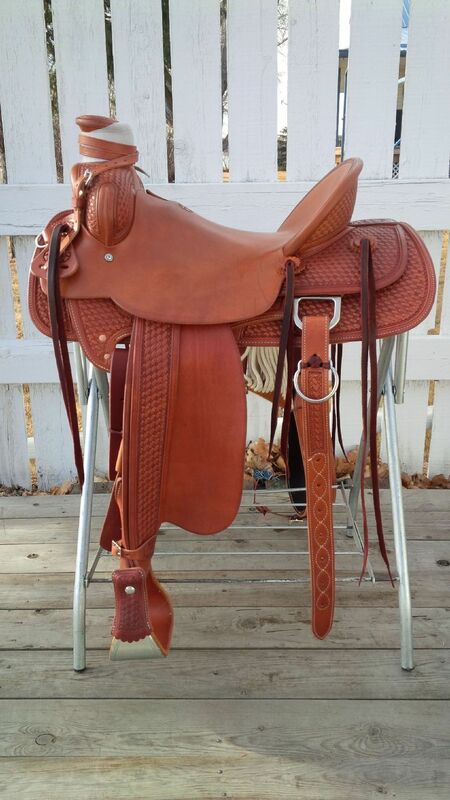 A sturdy, comfortable Wood Post Association saddle, this McCall Great Basin features a deep comfortable seat, smoothout leather seat, outside stirrup leathers, with half King Basket tooling, Stainless Steel hardware, straight up cantle, 4" Wade bell stirrups, and hobble ring. Cowboss Custom Wade 1616 QH bars built on a Timberline tree, half rough out Hermann Oak top grade leather with inlaid seat. Small Geometric tooling, Jeremiah Watt Rigging Hardware, Buckles, Dees, Conchos and Hobble Ring, 4" Monel Stirrups with heel blocks. This custom WP Pendleton #039 is smooth out with 1/2 Carlitos border and 1/2 Ence Oak with tooled outside leathers, 14" swell fork, 7/8 flat plate rigging, 1 1/2" Cheyenne Roll, Brass hardware & conchos, Mule Hide wrap, 6 saddle strings, rope strap and 4" Rawhide bells. 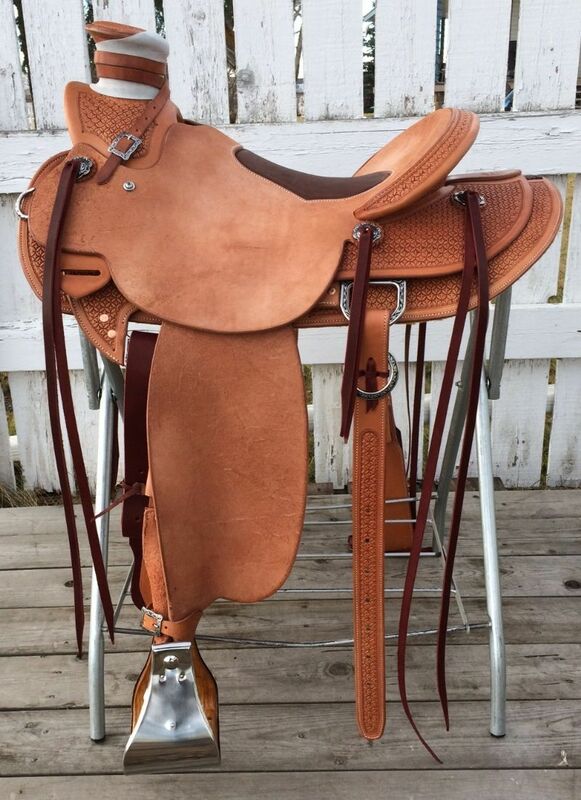 This NW Wade #193 is one of our best selling saddles with 1/2 Rough out, half Triweave and full 2 Line Border, 7/8 plate rigging, Stainless Steel Hardware, straight up cantle, 4" Rawhide covered Bells, Mulehide Horn Wrap, Hobble Ring, Crossover Lariat Strap. Traditional Cowboss Wade #1514 built on a Timberline tree, half roughout leather with inlaid seat. Has half Basket tooling, Jeremiah Watt Rigging Hardware, Buckles, Dees, Conchoes and Hobble Ring, 4 1/2" Monel Stirrups with heel blocks. McCall N Wade #194 is 1/2 Rought out, half King Basket, 7/8 plate rigging, Stainless Steel Hardware and Conchos, 1 1/4" Cheyenne Roll, 4" Bells, Mulehide Horn Wrap, Hobble Ring, Crossover Lariat Strap. Traditional Cowboss Wade #1401 built on a Timberline tree, Half roughout leather and has half Basket tooling, Jeremiah Watt Rigging Hardware, Buckles, Dees, and Hobble Ring, 5" Monel Stirrups with heel blocks. McCall NW Wade #061 has 1/2 Rought out, half Triweave, 7/8 plate rigging, Stainless Steel Hardware, Antique Pico Berry Conchos, 1 1/4" Cheyenne Roll, 4" Bells, Mulehide Horn Wrap, Hobble Ring, Crossover Lariat Strap. 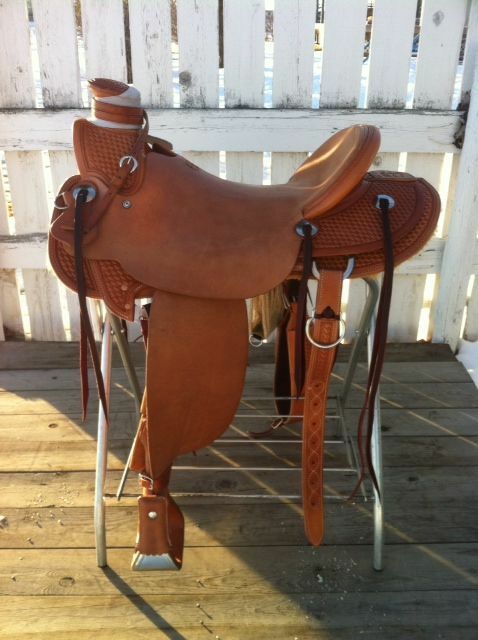 The Uinta is an all around Ranch Saddle #202. This Uinta is smooothout, is part Box tooled and two line border, with stainless steel hardware, conchos, and full D rigging. 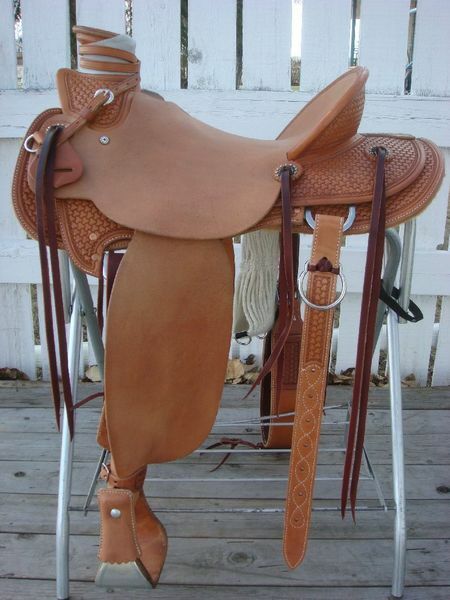 A sturdy, comfortable Wood Post Association saddle, this McCall Great Basin features a deep comfortable seat, smoothout leather seat with a full 2 Line Border with Part King Basket tooling, Stainless Steel hardware, 1" Cheyenne Roll, rawhide bell stirrups, and hobble ring. This Northwest Wade is smooth out, 3/4 Triweave and 3/4 Barb Wire border, 7/8 plate rigging, Brass Hardware, in laid seat, straight up 4" cantle, 4" Bells, Mulehide Horn Wrap, Hobble Ring, Crossover Lariat Strap and dark bucking rolls. 1/2 Rought out, part Ence Oak with full 2 Line Border, 7/8 plate rigging, Stainless Steel Hardware and strings, 1 1/4" Cheyenne Roll, Mule hide Horn Wrap, Hobble Ring, Crossover Lariat Strap and 4" Bells. This 1/2 Rough out with full 2 Line Border with Part River Oak tooling NW Wade has 7/8 plate rigging, Stainless Steel Hardware, 1" Cheyenne Roll, 4" Wade Bells, Mulehide Horn Wrap, Hobble Ring, Crossover Lariat Strap. 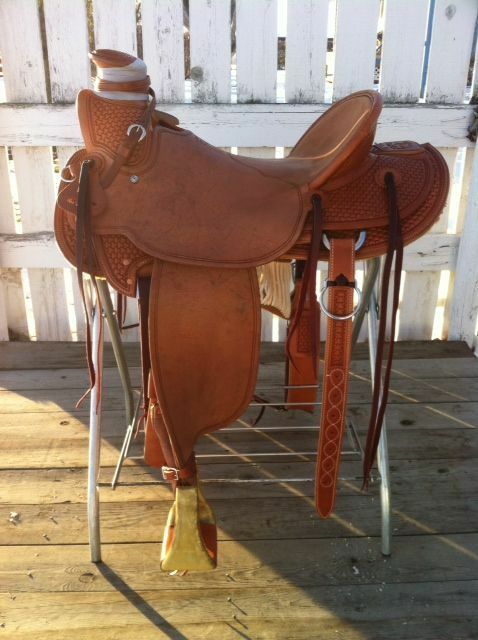 This plain Rough Out Saddle is all about work. Accented with a 1" Rawhide Cheyenne Roll, 7/8 Flat Plate Rigging, Mulehide wrap, Crossover Rope Strap, and SS hardware and conchos. A perfect blend of Brass and Rawhide, this Northwest Wade is half roughout, with half Triweave, and a 2 line border on jockey and fenders, 7/8 plate rigging, Brass hardware, Straight Up Rawhide Cantle Binding, Rawhide horn rim, mulehide wrap, lariat strap, hobble ring and 4" Rawhide Bell stirrups. Optional Matching Breast Collar and Bucking Rolls available. 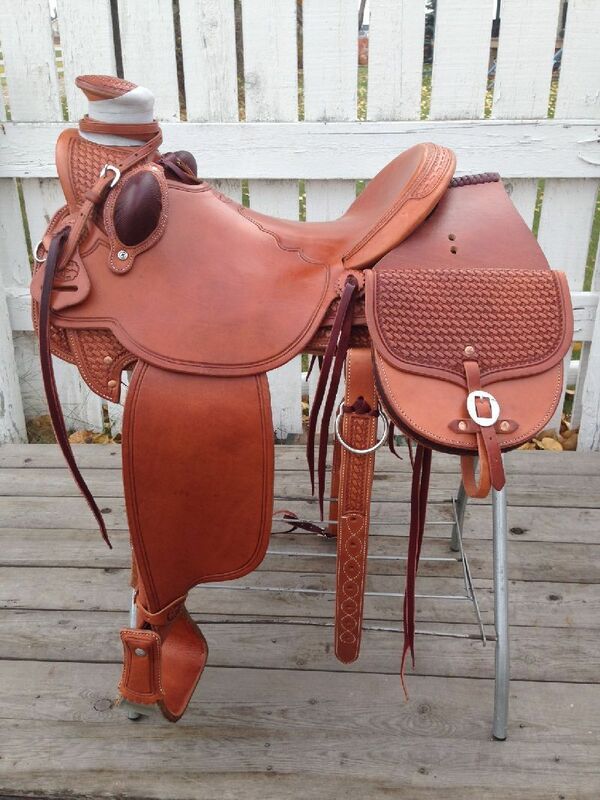 An awesome colt riding saddle, this Pendleton is a total smoothout with no tooling, 14" swell fork, 7/8 brass ring rigging, 1 1/2" Gutherie Style Cheyanne roll with rawhide, Brass hardware & Antique Pico Berry conchos, with Latigo wrap, 6 saddle strings, a removeable rope strap and 4" Rawhide bells. This 98 Wade is half rough out with a straight up 4" cantle, half Tri Weave tooled, 7/8 Flat Plate Rigging, Mulehide wrap, Crossover Rope Strap, hobble ring, SS hardware with Pico Berry conchos, and 4" Bell stirrups. Smooth Out half King Basket w/ tooled outside leathers, 7/8 plate rigging, Stainless Steel Hardware, 1" Cheyenne Roll, 4" Bells, Mulehide Horn Wrap, Crossover Lariat Strap. Smooth Out with full Juan Border, 7/8 plate rigging, Stainless Steel Hardware, 1 1/4" Cheyenne Roll, 4" Rawhide Bells, Mulehide Horn Wrap, Crossover Lariat Strap and hobble ring. 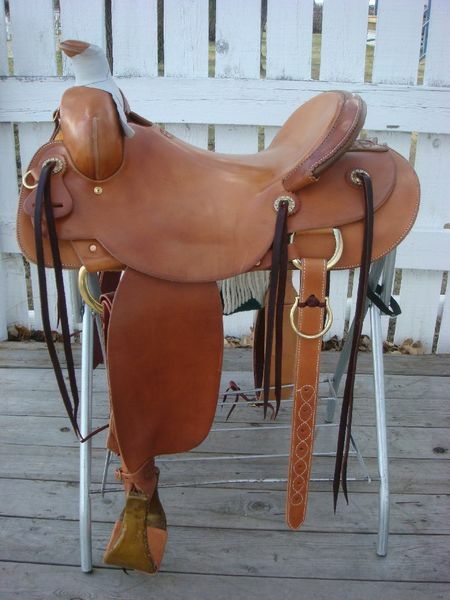 A sturdy, comfortable Wood Post Association saddle, this McCall Great Basin features a deep comfortable seat, smoothout leather seat with a full Juan Border, Brass hardware and conchos, straight up cantle, rawhide bell stirrups, rawhide covered hobble ring. 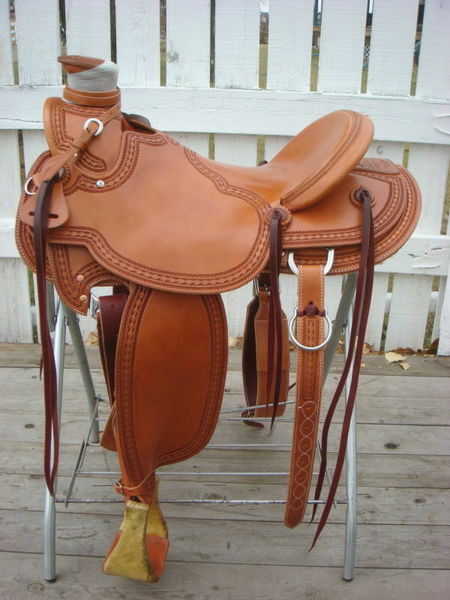 An awesome colt riding saddle, this Pendleton is beautifully toolede with Ence Oak and Carlitos Boarder, 14" swell fork, 7/8 plate rigging, 1 1/2" Cheyenne Roll with overlay tooled stirup leathers, Brass hardware & conchos, with Latigo wrap, 6 saddle strings, a crossover rope strap and 4" Rawhide bells. 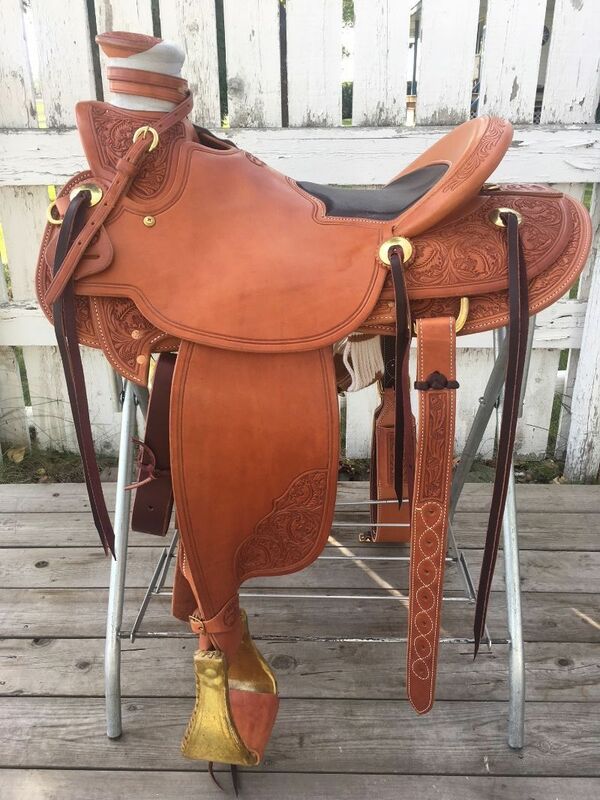 An awesome colt riding saddle, this Pendleton is plain and simple, 14" swell fork, 7/8 plate rigging, Rawhide Cheyenne Roll w/Overlay, Brass hardware & Pico Berry conchos, Rawhide horn rim with Latigo wrap, 6 saddle strings and a crossover rope strap. Cowboy all day in this deep seat Pendleton. River Oak Carving with a 2 Line Border, 7/8 plate rigging, Brass Hardware and Conchos, Straight Up Cantle Binding, 4" Rawhide Bells, Mulehide Horn Wrap, Crossover Lariat Strap, Brass Hobble Ring. Nice Deep Feeling Seat !! McCall's Visalia 3B. Flat plate rigging, Full 2 Line border with Sheridan Floral carved corners and cantle dish, dark oil, Brass conchos & hardware, and 3" Rawhide covered stirrups. This slick fork allows a narrow feeling seat and continues to be popular with cowboys, outfitters, and trail riders alike. 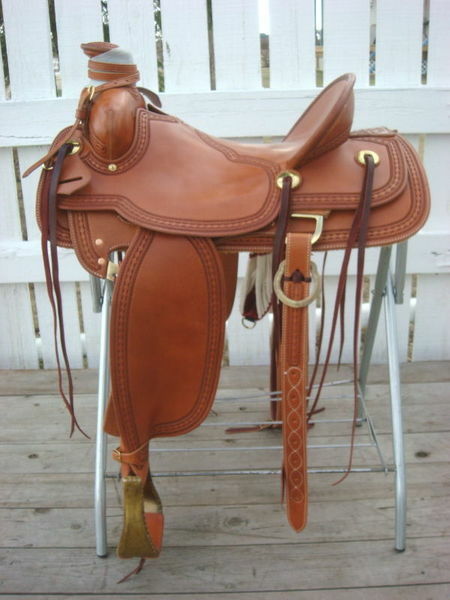 Just like Grandpa's Rig, Traditional 1890's style Loop Seat, sturdy 7/8 Brass Ring Rigging, Brass Conchos w/ 8 strings, 4 1/2" Straight Up Cantle w/ rear staple pouch, full Juan Border. One of the finest Old Timers you'll find anywhere. This smooth out McCall Northwest Wade has part Triweave and a full 2 Line Border, 7/8 plate rigging, Stainless Steel hardware, straight up cantle, 4" Wade Bells, mulehide horn wrap, lariat strap w/ buckle, saddle strings, hobble ring. Smooth Out / Rough Out Combo with a 2 Line Border, 7/8 plate rigging, SS hardware, straight up cantle, 4" bells, mulehide horn wrap, lariat strap w/ buckle, saddle strings, hobble ring. Daisy carved corners, Rough out with an Inlaid Seat, Full double dropped brass ring rigging, 2" rawhide covered visalia stirrups, conchos w/ rear strings. A ranch cutter designed for the Versatility Class. Rein, Cut, & Rope in this one. A sturdy, comfortable Wood Post Association saddle, this McCall Great Basin features a deep comfortable seat, rough out jockeys and fenders with a full 2 Line Border and Brass hardware. Rough Out Seat and Fenders, Half Mini Basket with Carlitos Border, 1" cheyenne roll, 7/8 plate rigging, mulehide horn wrap, lariat strap w/ buckle, saddle strings, hobble ring, SS hardware. 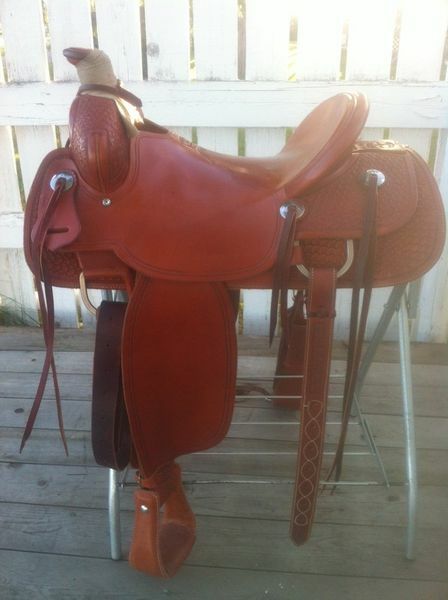 This is a very nicely finished saddle. This square skirted slick fork is based on McCalls 98 Wade platform with some our own exclusive features. The feel of this modified cantle is second to none, and the fender design provides for a nice close contact. Built for a full days work. Half Rough Out , half smooth out Basket, with full 2 Line Border, 7/8 plate rigging, Stainless Steel Hardware, Cheyenne Roll, 4" Rawhide bells, mulehide horn wrap, lariat strap w/ buckle, saddle strings, hobble ring. 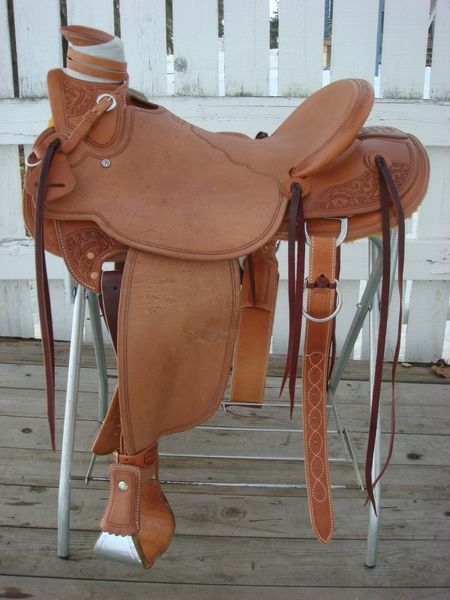 This Cowboy Association has a deep comfortable seat and is an awesome colt riding saddle. Part King Basket tooling, 14" swells, 7/8 plate rigging, Cheyenne Roll, Brass hardware & conchos, mulehide horn wrap, saddle strings. Smooth Out w/ Tri Weave tooling and full 2 Line Border, 7/8 plate rigging, Brass Hardware, 4 1/2" Straight Up Rawhide Cantle Binding, 4" Rawhide bells, mulehide horn wrap, lariat strap w/ buckle, saddle strings, rawhide hobble ring. Daisy carving on the rear housings, fork, and rigging plate accent this nicely finished 98 Wade, with a 2 line border over the seat and fenders. Cheyenne roll, guadalajara style horn cap, mulehide wrap, crossover lariat strap, saddle strings, hobble ring. Add a pair of our monel stirrups to complete the package. Full Rough Out , 7/8 plate rigging, Brass Hardware, Cheyenne Roll, 4" Rawhide bells, mulehide horn wrap, lariat strap w/ buckle, saddle strings, hobble ring. This was a custom order for a local cowboy. 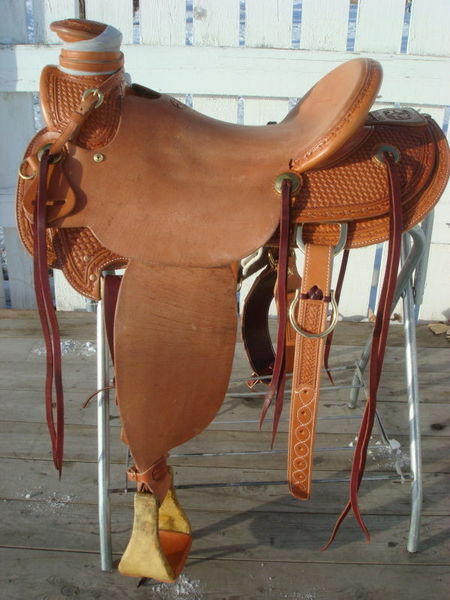 Flat Plate rigging, a bit of rawhide trim, and rounded Wade skirts set this saddle apart from the standard Uinta. The tooling is a King basket / River Oak Combo with a 2 line border. A traditional no nonsense Cowboy Association. Heavier swell fork saddle with a deep, narrow feeling seat. Simple 2 Line Border on smooth out leather, 7/8 plate rigging w/ slotted rear, Straight Up Cantle, SS hardware, mulehide horn wrap, lariat strap, 6 strings. Excellent for riding colts, or all day in the mountains. Rough Out Seat & Fenders with Half MiniBasket and Barbed Wire Border, 7/8 plate rigging, Brass hardware & conchos, rawhide straight up cantle, 4" bells, mulehide horn wrap, lariat strap w/ buckle, saddle strings, hobble ring. Smooth Out with half Carlos / half 2 Line Border, 7/8 plate rigging, SS hardware, straight up cantle, 4" bells, mulehide horn wrap, lariat strap w/ buckle, saddle strings, hobble ring. Smooth Out w/ Part Basket and Carlos Border, 7/8 plate rigging, brass hardware, leather cheyenne roll, 4" rawhide bells, mulehide horn wrap, lariat strap w/ buckle, saddle strings, hobble ring. A nicely finished Wood Post Association with half Large Box stamp and a Carlos border, 7/8 plate rigging, 1" Cheyenne Roll, SS hardware, antique pico conchos, mulehide horn wrap, crossover lariat strap, saddle strings, hobble ring. Half King Basket w/ Carlos border, Full double rigging, rawhide covered oxbow stirrups. A Ranch Cutter designed for the Versatility Class. Very well balanced saddle with lots of mobility. This functional Wood Post Association is a base model plain rough out, 7/8 plate rigging, Cheyenne Roll, Brass hardware, mulehide horn wrap, lariat strap w/ buckle, saddle strings, hobble ring. The Guthrie is considered the "Rancher's Roper". Full double rig and leg cuts in the skirts to provide a close contact. If you're a team roper this one is designed to get you up and out of, yet it's a deep enough seat that you can ride in all day. 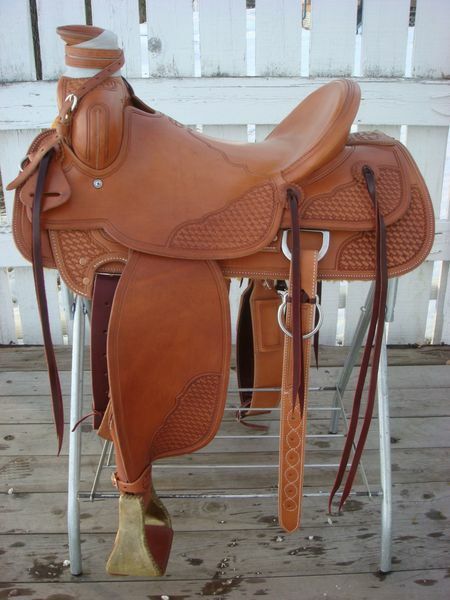 Compare this saddle to any roper on the market and you'll be very impressed. This square skirted slick fork is based on McCalls 98 Wade platform with a few of our own exclusive features. The feel of this modified cantle is second to none, and the fender design provides for a nice close contact. Built for a full days work. This sleek one of a kind rig is built on a custom 16 1/2" Jeremiah Watt tree. Attention to detail shines through in the unique leaf carving wound around a basket border on Hermann Oak leather. 4 1/2" hand made Monel / Oak stirrups with heel blocks. 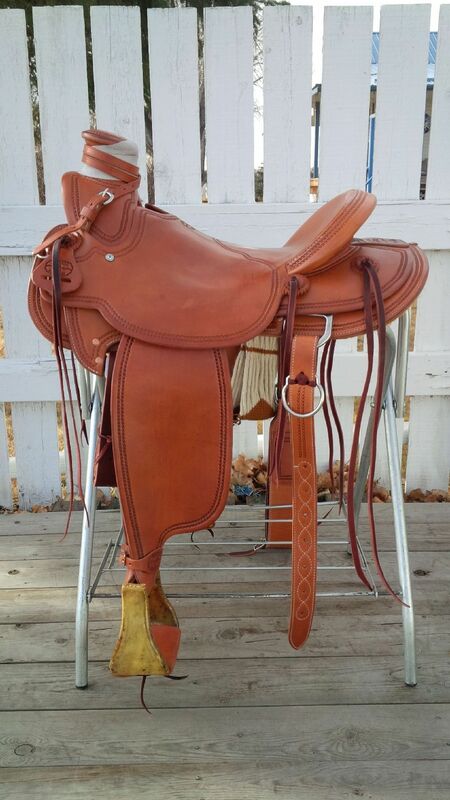 Smooth Out Seat and Fenders, Half Mini Basket stamp, dropped in skirt rigging, 1" cheyenne roll, outside tooled stirrup leathers, mulehide horn wrap, lariat strap w/ buckle, saddle strings, hobble ring, brass hardware. Very nicely detailed saddle. Shown with optional buck rolls. Built on a 17" tree. Smooth out leather with half King basket, 7/8 plate rigging, SS hardware, cheyenne roll, 4" bells, mulehide horn wrap, lariat strap w/ buckle, saddle strings, hobble ring. 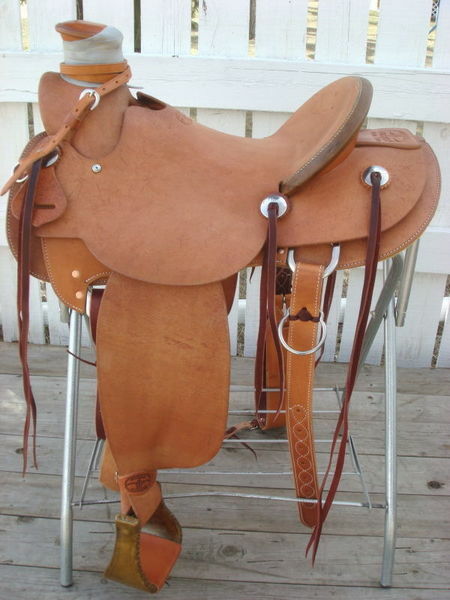 Plain Rough Out makes this saddle the ideal no frills working rig, brass hardware, cheyenne roll, 4" bells, mulehide horn wrap, lariat strap w/ buckle, saddle strings, hobble ring. McCall's Visalia 3B. Butterfly skirts help keep the flat plate rigging tucked in tight for a nice close feel. Finished with a Carlos border with Ence Oak carved corners, medium dark oil, Brass hardware w/ 2 sets of breast collar dees, and 3" Brass covered stirrups. This slick fork allows a narrow feelin seat and continues to be popular with cowboys, outfitters, and trail riders alike. McCall's Visalia 3B. This slick fork allows a good feelin narrow seat and continues to be popular with cowboys, outfitters, and trail riders alike. This unique 3B was built with a Great Plains finished horn cap, dark oil, dropped brass ring rigging and a 1" cheyenne roll. 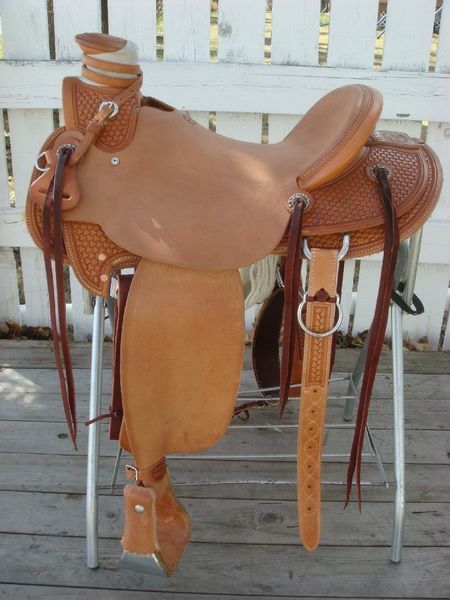 Smooth Out Seat and Fenders with corner Mountain Oak tooling, dropped in skirt rigging, 1 1/4" cheyenne roll, outside tooled stirrup leathers, mulehide horn wrap, lariat strap w/ buckle, saddle strings, hobble ring, brass hardware. 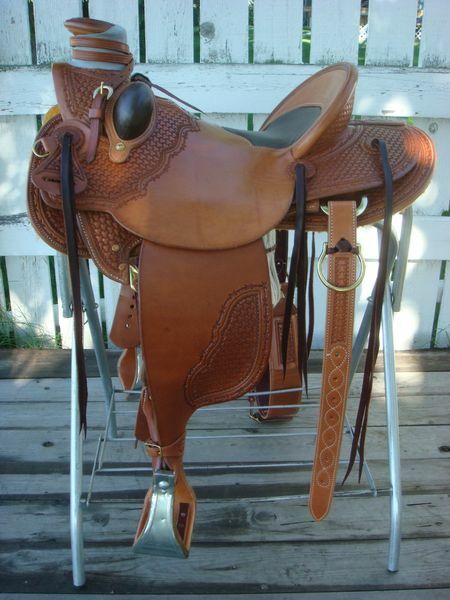 Smooth Out Seat and Fenders w/ part Southwest tooling, 7/8 plate rigging, cheyenne roll, stirrup leathers pretwisted, mulehide horn wrap, lariat strap w/ buckle, saddle strings, hobble ring, SS hardware. 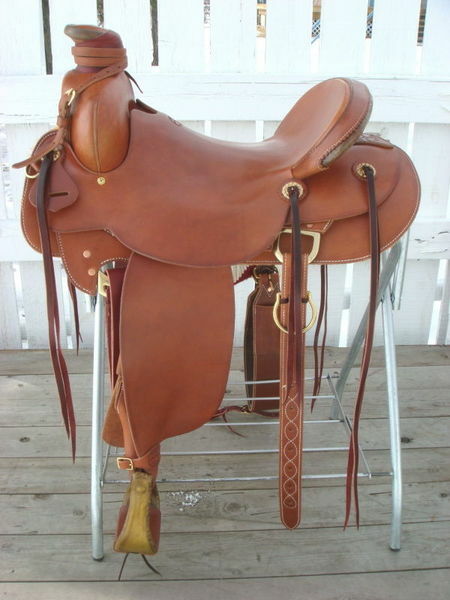 Classic Association saddle with smooth out leather with a simple 2 line border, 7/8 plate rigging, Cheyenne Roll, Brass hardware, mulehide horn wrap, saddle strings, and hobble ring. This modified Association tree has become a standby for those cowboys that love a wider deeper swell fork. Smooth Out Half King Basket w/ Basket Border, 7/8 plate rigging, brass hardware, rawhide cheyenne roll and horn rim, 4" rawhide bells, mulehide horn wrap, lariat strap w/ buckle, saddle strings, hobble ring. Rough Out Seat and Fenders, Rough Out Skirts with Southwest stamp on rear housings, fork, plate rigging and cantle back. New style dropped 7/8 plate rigging, straight up cantle, stirrup leathers pretwisted, mulehide horn wrap, lariat strap w/ buckle, saddle strings, hobble ring, brass hardware. In skirt plate rigging and a bit smaller post horn shaves 3 or 4 lbs off the traditional McCall wade. 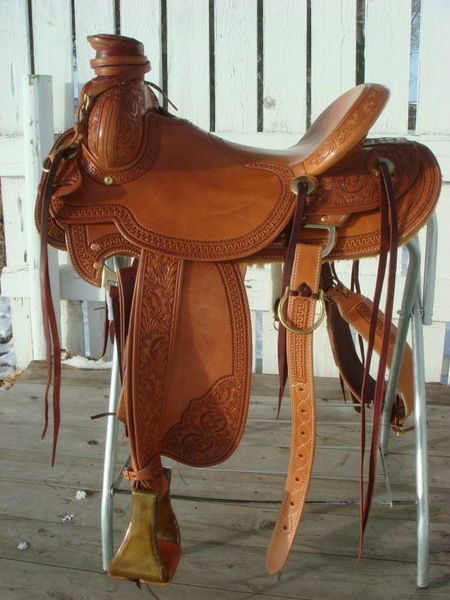 This cowboy association has a rough out seat and fenders with an intricate Carlitos border, straight up rawhide cantle and horn rim, brass hardware, mulehide horn wrap, saddle strings, and hobble ring. Smooth Out 3/4 King Basket w/ tooled outside leathers, 7/8 plate rigging, brass hardware, cheyenne roll, 4" half covered & tooled bells, mulehide horn wrap, lariat strap w/ buckle, saddle strings, hobble ring. Rough Out Seat and Fenders, Half Southwest tooled. 7/8 plate rigging, 1 1/4" Cheyenne roll, stirrup leathers pretwisted, mulehide horn wrap, lariat strap w/ buckle, saddle strings, hobble ring, brass hardware. You bigger guys will melt into the 17" seat on this custom 98. Full rough out , straight up rawhide cantle and horn rim, scalloped rawhide over front fork, and finished with a 2 line border. 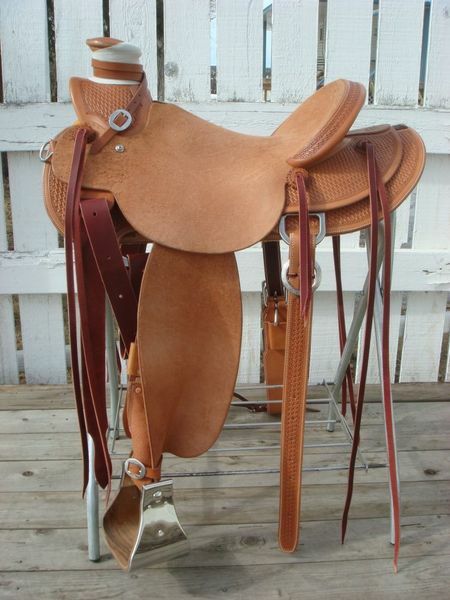 Stirrup leathers pretwisted, mulehide horn wrap, lariat strap w/ buckle, saddle strings, hobble ring, brass hardware. Half King Basket / Ence Oak combo w/ Rough Out Seat and Fenders, 7/8 plate rigging, 1" Cheyenne Roll, stirrup leathers pretwisted, mulehide horn wrap, lariat strap w/ buckle, saddle strings, hobble ring, SS hardware. 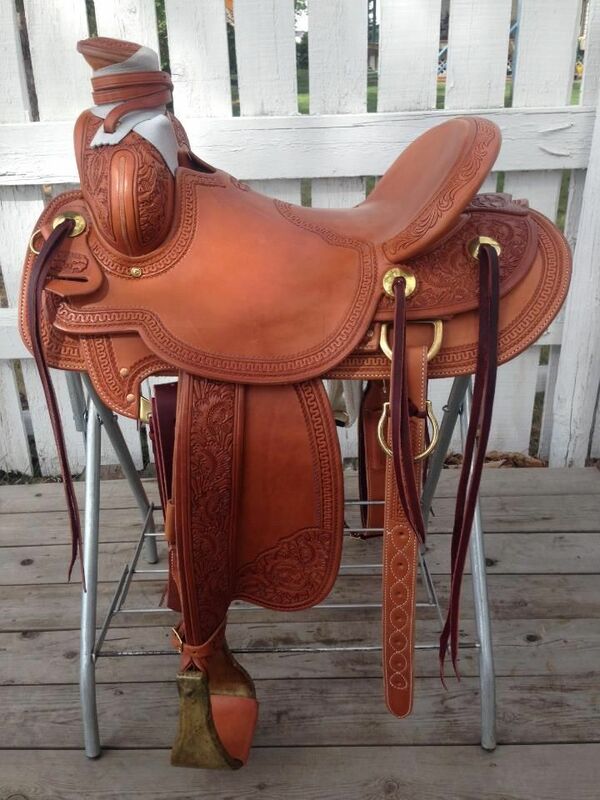 Rough Out Seat and Fenders, 7/8 plate rigging, straight up cantle, Half Large Box Tooled, stirrup leathers pretwisted, mulehide horn wrap, lariat strap w/ buckle, saddle strings, hobble ring, brass hardware. 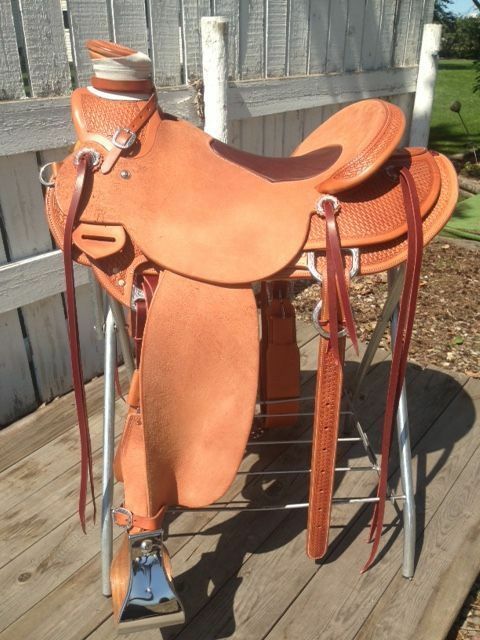 17" seat with 4 1/2" straight up cantle. Carlos Deluxe / 2 Line Border combo, 7/8 plate rigging, brass hardware, 4" rawhide bells, mulehide horn wrap, lariat strap w/ buckle, saddle strings, hobble ring. This NW Wade measures a 16 1/4" finished, Smooth Out w/ Old Style Border Roll, 7/8 plate rigging, rawhide cheyenne roll and horn rim, 4" rawhide bells, mulehide horn wrap, lariat strap w/ buckle, saddle strings, hobble ring. This saddle is traditional 1890's styling with a 5" cantle, beveled loop seat, laced stirrup leather, and brass Visalia stirrups. It has a 3 piece oval horn, bronze ring rig double & authentic 8 strings. It appeals to the reenactor, the S.A.S.S. and the individual who likes the look of Grampa's rig. Also looks great in dark chocolate. 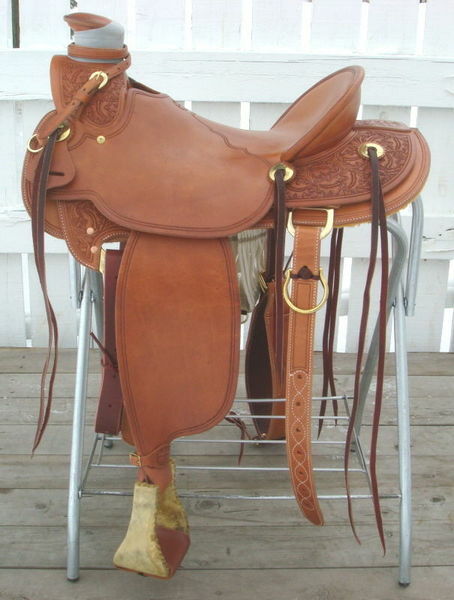 This Wood Post Association is a 16" hard seat with a 5" cantle, smooth out leather with a full Juan border, outside stirrup leathers, 7/8 plate rigging, straight up cantle binding, brass hardware, mulehide horn wrap, lariat strap w/ buckle, saddle strings, hobble ring. This square skirted slick fork is our exclusive design, and bears the Cowboss stamp. The feel of this modified cantle is second to none, and the fender design provides for a nice close contact. Built for a full days work. Based on the Jordan Valley, this very comfortable Visalia 3B was built by McCall with our own design features built in. 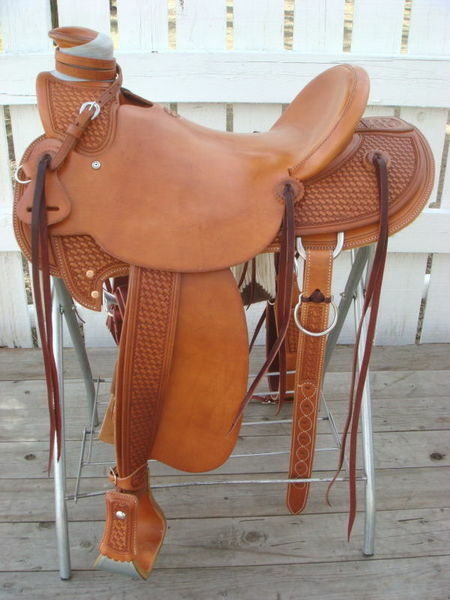 A slick fork saddle with a regular #4 dally horn and a bit more width in the cantle. Flat plate rigging, brass hardware, 1" rawhide cheyenne roll, just a bit of Wild Rose carving with a 2 line border.